So, Cenk Uygur (Young Turks), darling of the Professional Left, was, apparently, ranting again today about the President – I don’t know what he was hyperventilating about this time, I only watch him now when I’m in need of a cure for insomnia. This video (you can see it all here) was made just a year in to Barack Obama’s presidency – but by then Uygur had already concluded that the President had failed him and his fellow ‘progressives’. A 2009 bill that amended the Civil Rights Act of 1964 was an incredibly easy victory? A 2009 bill that finally gave legal support to Lilly Ledbetter’s 1998 equal-pay lawsuit regarding pay discrimination was “minor”? ….The bill was re-introduced in the 111th Congress in January 2009. It passed in the House of Representatives with 247 votes in support and 171 against. The vote was nearly perfectly split along party lines…. The Lilly Ledbetter Fair Pay Act passed the Senate, 61-36, on January 22, 2009. President Obama has long championed this bill and Lilly Ledbetter’s cause, and by signing it into law, he will ensure that women like Ms. Ledbetter and other victims of pay discrimination can effectively challenge unequal pay. On January 29, Obama signed the bill into law. It was the first act he signed as president, and it fulfilled his campaign pledge to nullify Ledbetter v. Goodyear. So, did Cenk sneer at the successful conclusion to the long struggle for equal pay for women because he regards equal pay for women as “minor”, or because it was President Obama who signed the bill? Maybe both? Dunno. So, from being a Ronald Reagan fan (which he was) and a Federalist Society supporter (wow!) and a critic of “excessive regulation” (good grief), to being a fully fledged Professional Left ‘progressive’ in no time at all …. that’s, um, change we can believe in! Of course leopards can change their political spots, and it’s very lovely when they shift the spots from right to left, but is there not a touch of the Arianna Huffingtons about this guy? The political shift has paid off beautifully, he’s now a professional leftie media star! (But still not big in to equal pay for women). Thank you ‘Proud of Obama’ for the link. why isn’t he choking on pretzels in front of his tv, like a proper pres? Time: POTUS hits links Sunday. Motorcade arrived at the golf course at Andrews at 10:50 am EDT. The president’s foursome will include Eric Whitaker, David Katz and Marvin Nicholson. 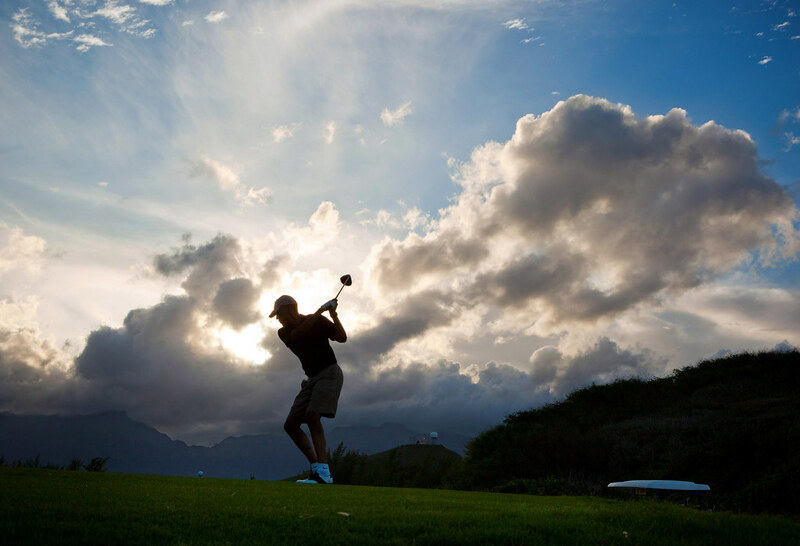 (Okay, okay, this photo isn’t, em, technically from Andrews: “President Barack Obama plays golf at the Kaneohe Klipper Marine Golf Course in Oahu, Hawaii, Dec. 26, 2010. Official White House Photo by Pete Souza). I’ve had a few requests for this video of Rev Al Sharpton – I tried emailing it to one person, but the file was too big and bounced back! If you click on the share menu at the top left of the video you should – I hope – be able to download it or embed it from there. If you have any problems let me know.